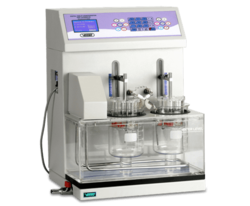 Our product range includes a wide range of digital automatic tap/bulk density test apparatus, advanced programmable digital tablet disintegration test apparatus and tablet disintegration test apparatus. 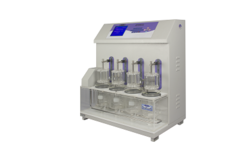 We are a leading manufacturer ofDigital Automatic Tap/bulk Density Test Apparatus. Equipped with Built-in Validation Facility. Test method storage facility for 24 test methods. Auto Tap repeats facility until the test is completed. Calculates Bulk Density, Tapped Density, Compressibility Index, and Hausner Ratio. Simultaneous rotating and tapping of the cylinders. Compliant with USP - I and USP - II methods. Also available as pr ASTM Standards. Optional Acoustic Cabinet for noise reduction. TAPPING RATE 300 taps/min approx. TAPPING RATE 250 taps/min approx. Designed to conduct four different tests individually as well as simultaneously. 'PAUSE' facility: This facility permits to check disintegration state of the tablets intermittently and continue test without disturbing test parameters. While one basket is in operation the other three baskets can be deactivated. Password protection at different level. Power failure indication program is incorporated. Memory to store 45 tests method parameters. Input: Tactile Keypad + PS-2/PC Keyboard. Dimensions 390 x 360 x 570 mm. Two different batch products can be analyzed simultaneously. Memory to store 25 tests method parameters. Display: Informative 240 x 64, blue graphic LCD display. 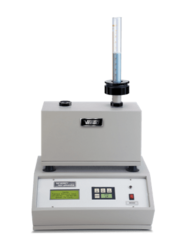 Looking for TAP-BULK DENSITY TEST APPARATUS ?